Although several studies have shown the efficacy of third-generation aromatase inhibitors (AIs) in women with breast cancer, the role of such molecules remains elusive in male breast cancer patients. It is also unknown whether the addition of gonadotropin-releasing hormone (GnRH) analogues to AIs would be a superior strategy or not. This pooled analysis was conducted in accordance with the PRISMA guidelines. 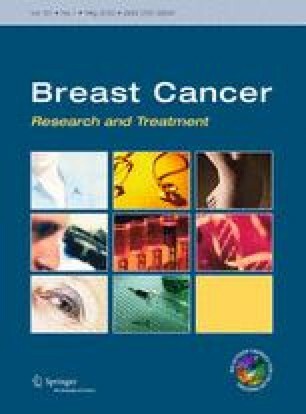 All studies that examined the efficacy of AIs in metastatic male breast cancer were considered eligible. Overall, 15 studies (105 cases) were eligible for this pooled analysis. The mean age of the study sample was 62.8 years. ER status was positive in all eligible cases. AI was given as first line in 61.5 % of cases. GnRH analogue was co-administered with AI in 37.1 % of cases (n = 39). CR, PR, SD and PD were achieved in 5.7, 23.8, 37.2 and 33.3 % of cases, respectively. The median PFS and OS were equal to 10.0 and 39.0 months, respectively. Co-administration of GnRH analogues was associated with more than threefold increase in rates of clinical benefit (OR = 3.37, 95 % CI 1.30–8.73) but did not seem to correlate with better PFS or OS. No statistically significant associations between the examined outcomes and the other parameters were noted. Available data suggest that AIs may potentially play a promising role in the optimal therapeutic strategy for metastatic male breast cancer patients. Especially, co-administration of AI with a GnRH analogue seems to increase the rate of clinical benefit and could be more effective, warranting further consideration. The online version of this article (doi: 10.1007/s10549-015-3356-9) contains supplementary material, which is available to authorized users.